As reported by Tennessean, drummer D.J. Fontana has died. Fontana played drums for Elvis Presley from 1954 to 1968, with Tennessean quoting music historian Charles Hughes as saying that Fontana “helped define the rhythmic foundations of the last several decades of pop music” thanks to his work with Presley. Fontana’s son confirmed the news in a Facebook post, saying that his father “passed away in his sleep.” Fontana, who had been the last surviving member of Presley’s band, was 87. 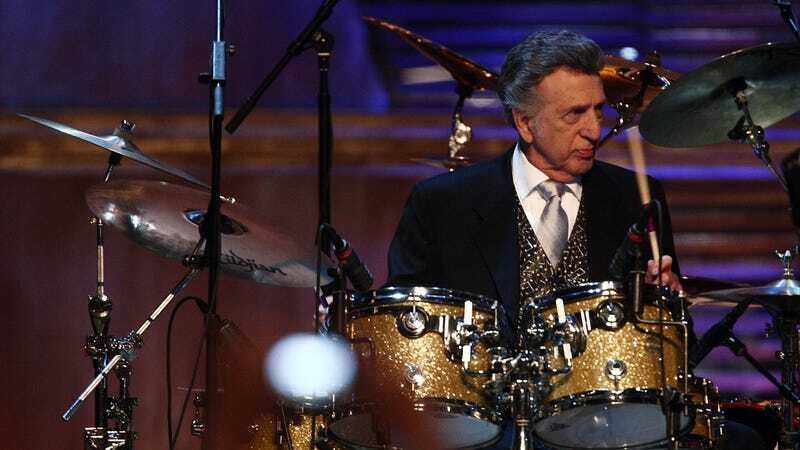 Fontana’s drum work appeared on “approximately 460" Elvis Presley songs, including major hits (obviously) like “Heartbreak Hotel,” “Blue Suede Shoes,” “All Shook Up,” “Jailhouse Rock,” and pretty much any other Elvis Presley song from that era. He was born in Louisiana in 1931 (as Dominic Joseph Fontana) and he was the in-house drummer for the Louisiana Hayride radio show before being asked to join Presley’s backing band in 1954—the group was dubbed the Blue Moon Boys and originally formed without a drummer at all. The band toured with Presley for four years, including multiple TV appearances, but Fontana stuck with Presley when the band broke up in 1958, recording and touring with him throughout the ‘60s. Fontana also occasionally performed and recorded with guitarist Scotty Moore separate from Presley, like on the star-studded album All The King’s Men in the ‘90s and on Ringo Starr’s “Beaucoups Of Blues” in the ‘70s.